I’ve had a few solutions sent in recently, so I wanted to share them with you all. 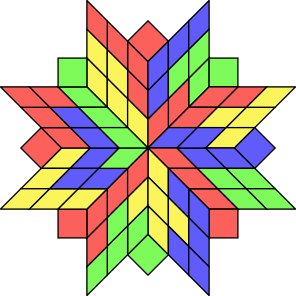 Speaking of rhombuses, Abaroth has been investigating color-matching puzzles using rhombic tiles. His puzzle page has more interesting material on color matching puzzles and symmetrical polyhex tilings. What’s interesting here is that although the outline of the tiling is symmetrical, the pattern of the cells isn’t. The lesson here is that being able to trade off some cell-level symmetry for more pattern-outline symmetry can give us a little variety in our choices of what we can tile.